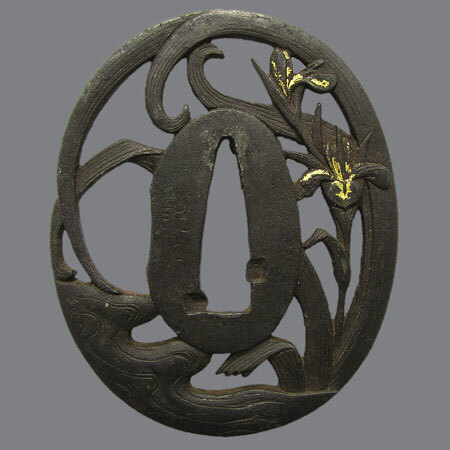 Iron tsuba for tanto with a design of iris standing in water stream. The iris represented on this tsuba - 燕子花 kakitsubata, rabbit-ear iris (Iris laevigata). It often grows in shallow water. Because of it's leaves, looking like swords, Iris embodies samurai spirit and symbolizes persistence and courage. 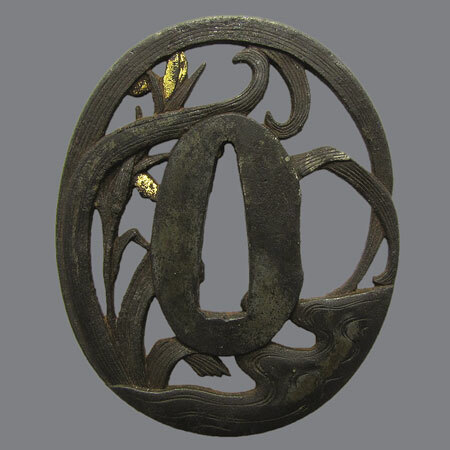 This tsuba is most probably made by Goto Tsunemasa (後藤常正) or by one of his students. In spite of the fact that Goto Tsunemasa educated in Goto family (where he have got his family name), the most of his works are made in the Ito school style. He begun to work in this style after he moved to the Kii (Kishu) province and set up a small shop with students. 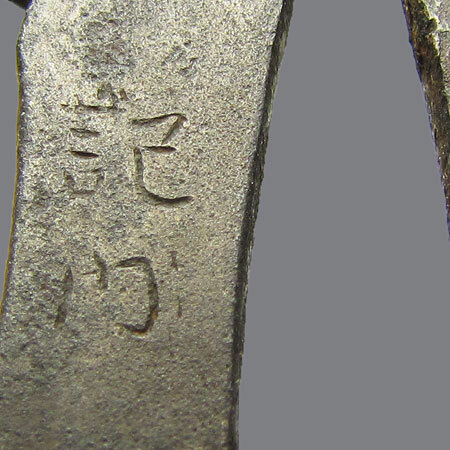 Inscription: 記州 (Kishu). Goto Tsunemasa school. Iron, niku bori ji sukashi, nunome zogan with gold, ten zogan with silver. Nagamaru gata, kaku mimi; 6,2 х 5,1 x 0,4 cm.